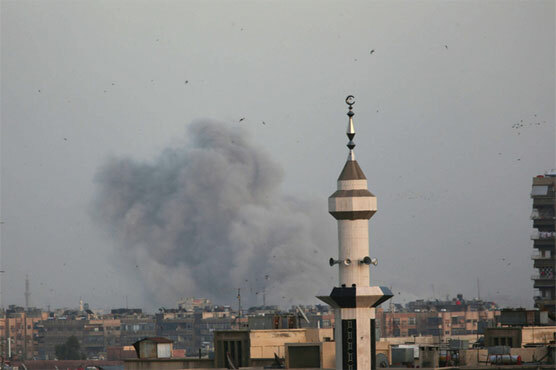 BEIRUT (AFP) – Syrian regime forces Friday intensified their bombardment of the Yarmuk Palestinian refugee camp on the edge of Damascus for a second successive day in a bid to dislodge Islamic State jihadists, a monitor said. The UN Palestinian refugee agency UNRWA said it was “deeply concerned about the fate of civilians” and thousands of refugees in and around the camp. “Regime forces have intensified their bombardments on several IS-controlled parts of Damascus, notably Hajar al-Aswad and in the Yarmuk camp,” said the Syrian Observatory for Human Rights. AFP images showed smoke billowing from Yarmuk after air strikes and soldiers targeted areas of the camp with artillery fire. The offensive was aimed at ridding the Damascus region of “terrorist groups”, state news agency SANA reported. Since regaining full control of Eastern Ghouta to the northeast of Damascus from rebels last week, the regime has turned its attention to jihadist-held districts in the capital s south. For days, it has targeted these areas with shelling and rocket fire as efforts to secure a negotiated evacuation have so far failed. The jihadists responded to the latest bombardment by firing missiles at nearby neighbourhoods, killing a civilian on Friday, said the Britain-based Observatory. SANA said five civilians were wounded, after reporting that four were killed and 52 injured on Thursday. In a statement on Friday, UNRWA said it was “deeply concerned about the fate of civilians after a week of increased violence and as intense fighting around Yarmuk continues”. The UN agency estimated there were about 6,000 Palestinian refugees in Yarmuk and about 6,000 in the surrounding areas. At its height their pseudo-state covered an area the size of Italy, but IS has since lost ground and now controls only around five percent of Syrian territory, according to Syria expert Fabrice Balanche.